The newest addition to our serviced office portfolio 19-22 Lower Baggot Street is situated in Dublin 2. The Business centre is a short distance from Stephens Green, Government buildings and Grand Canal Dock this prime address is one of Dublin's most prestigious addresses and is synonymous with many Government and professional bodies located nearby. Dublin 2 is home to the European headquarters for numerous multinational companies including Accenture, Dropbox, LinkedIn, Facebook and Twitter. The immediate area is the hub of Dublin's business, tourism and cultural districts with numerous hotels, restaurants, shopping facilities within minutes of the property. Built in the 1820's on historic Lower Baggot Street these interconnecting buildings retain many of their existing features including grand stair cases original windows and original fireplaces and mouldings. With capacity from 1- 250 desks in a mix of individual, interconnecting and open-plan offices we can accommodate companies of all sizes. 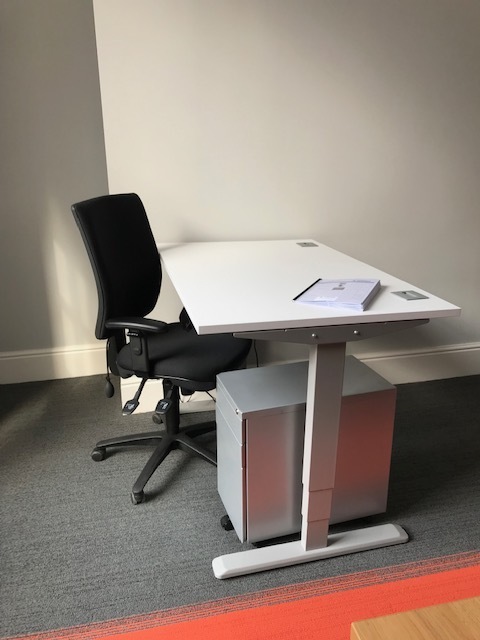 The standard desk offered in each office is a standing desk, no other business centre offers these as part of the standard furniture package. We are very excited to be the first business centre offering these. Standing Desks are electronically height adjustable to allow you to sit or stand. Continued research confirms the health hazards of sitting for long periods of time; increased risk of Diabetes, Obesity and High Cholesterol. Standing at your desk has been proven to improve the productivity and the overall health of your workforce. Give your employees the flexibility of sitting and standing up throughout the day. Sitting is one of the most unnatural positions for the human body. Experience more energy and concentration at work. Located just a short walk from Westland Row and Grand Canal train stations along with Stephens Green Luas station the centre is easily accessible via public Transport. Dublin Bikes routes are close by plus the Aircoach to Dublin Airport.